Replacing spins with falls, Elements the Awakening is a five column and three row slot game with 20 pre-set paylines and a theoretical return to player percentage of 96%. The use of falls allows the game to introduce an Avalanche Feature which combines with four different Free Fall Modes – all with their own Wild symbols – to create really unique and exciting gameplay. One of a number of slots which replace traditional spins with falling symbols instead, Elements the Awakening is a fun and intriguing game. To help you learn a little more about it, we have created a short guide below which will cover the game’s top jackpot, its symbols and features, its paytable and the available betting options. Top Jackpot – what can you win? 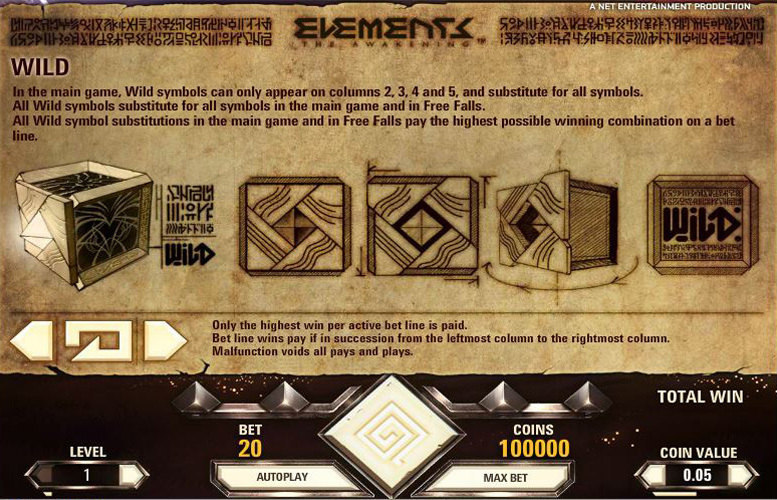 Elements the Awakening has 20 pre-set paylines and the most valuable winning combinations are those which see five identical symbols make up a payline. The most lucrative combination is one made up of five of the fire element symbols, which provides a win in coins equal to 1500 times the current bet level. At a bet level of ten that means that such a combination can provide a win of 15,000 coins and if that combination falls on all 20 paylines at once, the top jackpot of 300,000 coins results. At the highest possible coin value of 50p, that huge top jackpot is worth an undoubtedly impressive £150,000. Wilds are the only special symbols found within the Elements the Awakening slot but there are five distinctive versions of them. 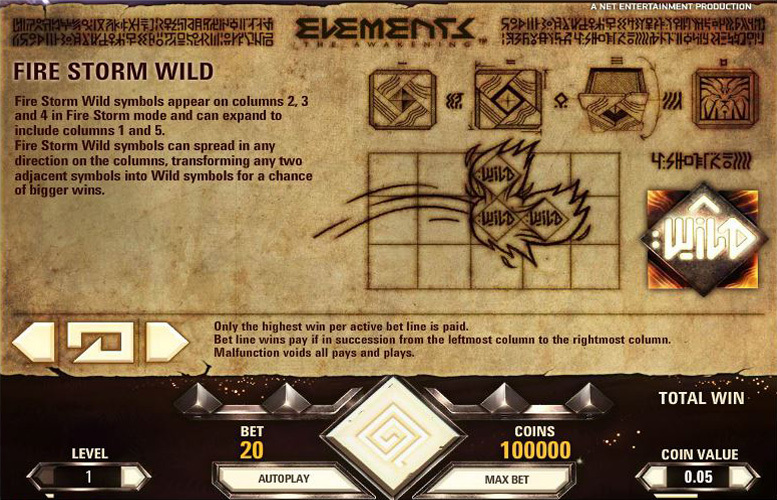 The Wilds found within the main game can appear anywhere on columns 2-5 and substitute for any other symbol to make up the most valuable possible combination for any payline. The other four types of Wild are only present within the game’s four different Free Falls modes, which are activated through the Avalanche Feature. In the main game when a winning combination is achieved, the symbols of that combination explode and disappear, causing an ‘avalanche’ of further symbols to take their place. Each time an avalanche occurs a level is added to the game’s ‘Avalanche Meter’ and if four occur consecutively, that meter is filled and ten free falls are triggered. Those free falls can be one of four different types – Fire Storm, Air Storm, Earth Storm or Water Storm – and which is triggered is determined by the game’s ‘Energy Meter’. For each winning combination in the game that includes an elemental symbol, energy is added to the energy meter sector for that element. The sector with the most energy when free falls are activated, determines the type of free falls to occur. The only difference between the varying free fall modes is that the special Wild symbol that appears differs in function. The ‘Fire Storm Wild’ appears on columns 2, 3 or 4 and can spread in any direction on the columns to transform two adjacent spaces into wilds. Two ‘Air Storm Wild’ symbols fall randomly during the first free fall, remain throughout all of the free falls, and move randomly to an adjacent space each fall. ‘Earth Storm Wilds’ can occupy any space on columns 2, 3 or 4 and remain in place until they have been involved in one winning combination, three avalanches or until no further wins are possible. Finally, ‘Water Storm Wilds’ are expanding wilds which, when they appear, expand vertically to cover the whole of their column. The symbols of Elements the Awakening are all themed around the four traditional elements of fire, water, earth and air, and the most valuable symbol of all is the main fire element symbol. A combination of five of those symbols along a payline rewards a player with a return in coins equal to 1500 times the bet level. Per line therefore, that combination pays out a total of 15,000 coins at the highest bet level and if the combination is achieved on all 20 paylines, the top jackpot of 300,000 coins results. The next most valuable symbols within the game, in order, are the earth element, the air element and the water element and these pay at a rate of 750, 500 and 300 times the bet level respectively for five symbol combinations. 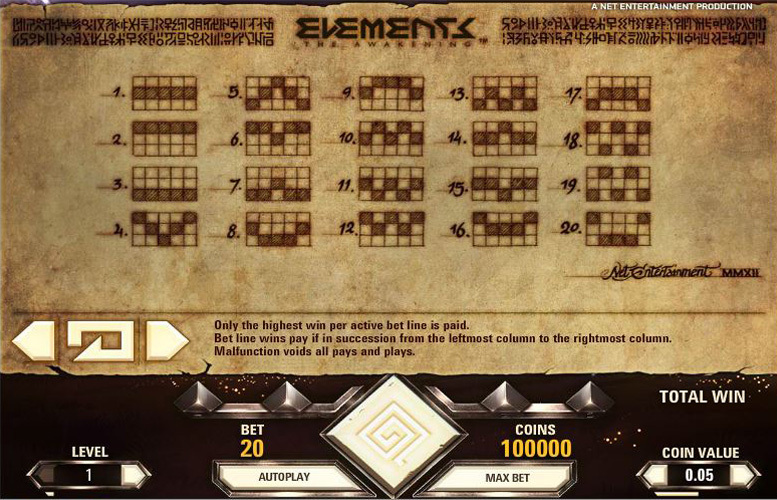 Players cannot alter the number of active paylines when playing Elements the Awakening but what they can do to control their stake, is to set the bet level and coin value for each spin. There are ten bet levels from 1-10 which determine how many coins are wagered per line and six coin value options from 1p to 50p. A minimum stake of just 20p can be achieved therefore, by setting the bet level at one coin per line and the coin value at just 1p. At the other end of the scale, the maximum stake of £100 is reached by setting a level of ten coins per line and a coin value of 50p. 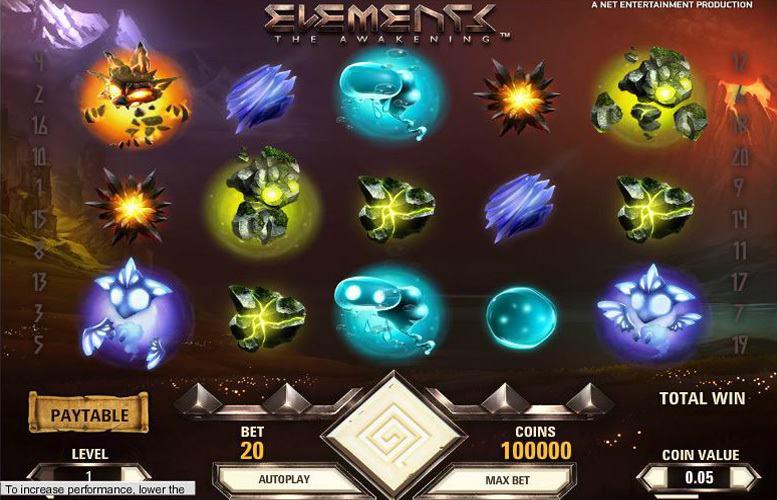 Elements the Awakening is an all-around excellent slots game, offering a really generous top jackpot along with fun and varied gameplay that makes it exciting to play the game for long periods of time. The four different free falls modes and their associated Wilds represent interesting special features which add nicely to the relatively simple main game and utilise the overall theme of the game very well. That theme is an attractive one which benefits from some eye-catching graphics but there is no doubt that it is the top jackpot which really makes this slot stand out from the crowd. That highest possible jackpot can be worth a huge £150,000 to a lucky player and that is unquestionably one of the best potential payouts around. This game has a rating of 4 / 5 with 246 total reviews by the users.